On Sunday morning, Lisa and I walked to the Wigwam restaurant for breakfast. 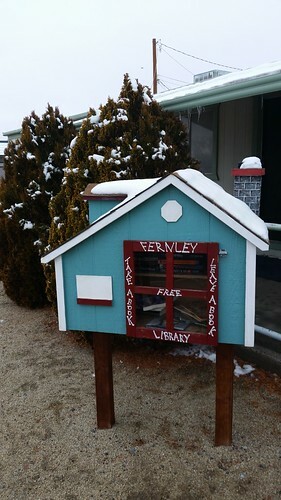 Some of the few of you still reading this may recall that there is a Little Free Library on Main Street in Fernley that was vandalized last year. It has been repaired, and it looks very picturesque in the snow as we walked past on the way to the Wigwam. At the restaurant, I had my usual breakfast, and Kuma Bear had his. 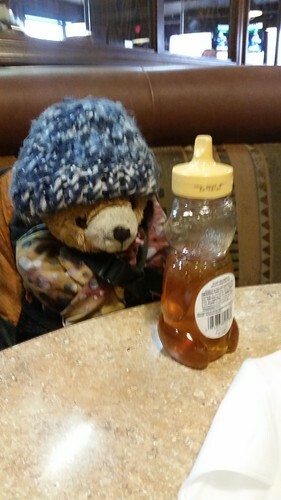 Probably kippers would be good, too, but Kuma didn't complain when the waitress brought him a honey bear. 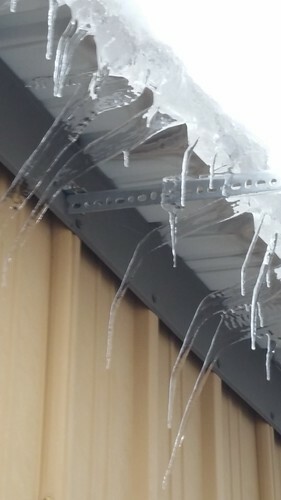 The icicles have been going through melt-refreeze cycles, with strange effects. 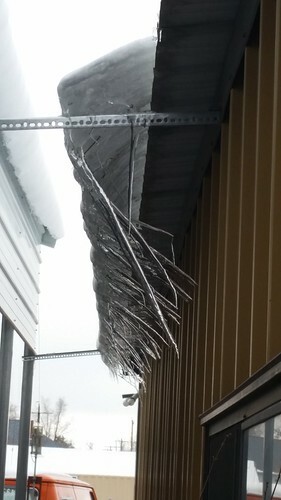 Because they keep sliding and changing orientation, the icicles keep reforming in new shapes. This morning, they were holding on by a thread. The longest one looked to me to at least a meter long. Temperatures must have drifted up a degree or two this morning, because the line of icicles on the side of the garage finally gave way with a whoosh of falling snow and clatter of shattering ice.